Home Blogger SEO How to Add AdSense Ads Below Post Title in Blogger. Have you got approval from adsense? Oh means you're still not earning that much? Then you really need to add adsense ads below post title in blogger, because adsense ads below post title gets most clicks in compare to any other ads place. And clicks are what we all want! If you are a newbie blogger then earning from adsense ads is the only way to earn some decent money with your blog. Or even it’s not about newbie blogger, a professional blogger also use adsense ads in his/her blog because we all want to earn money no matter how. Blogger allows us to add adsense ads with its html/java gadget but with this gadget we can only add ads in the side bars or any where according to our template layout but we can’t put adsense ads below post title. Don’t worry because it’s a world of professionals and we know professionals are here to make everything easier for us..!! How to insert adsense ads below post title? Step 1:- Go to Google Adsense and login with your approved account. Top 5 Ways to Create Quality Backlinks For Your Blog. Step 2:- Now click on “New Ad Unit” option. Step 3:- Now fill the name as you want and choose a add size and then click on “Save and Get Code”. 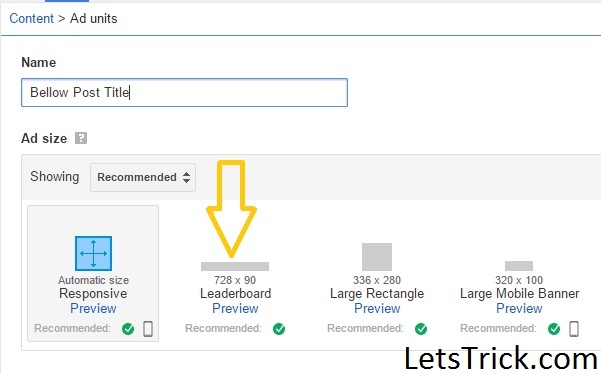 I suggest you to choose 728x930 Leaderboard because it looks decent below our blog title, you can see I have already used it on this post. 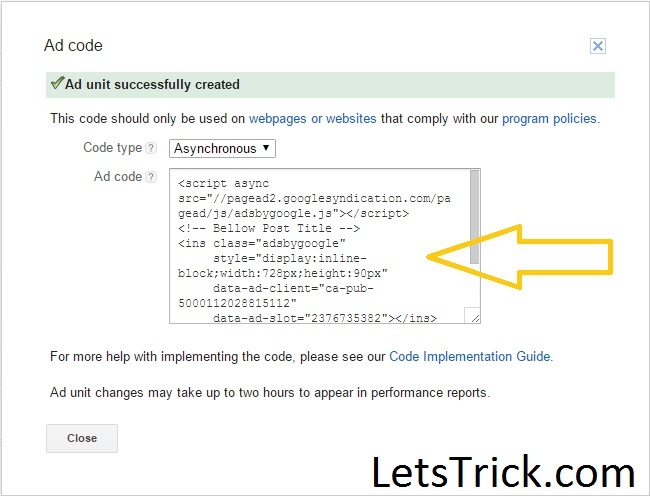 Step 4:- Then a popup will come which contains adsense code, you have to copy that code and save it on notepad. Now we have to parse this code. To parse this adsense code we have lots of free adsense ad code converter tools. I personally recommend you to use this one – Bloggertipstricks html encoder tool. Just go to this tool and paste your adsense code in the “Enter Code” box and then just copy the parsed code from “Parsed code” Box and paste it somewhere (like notepad) because you’ll need it again. Step 6:- Now we have to go to Blogger and login. 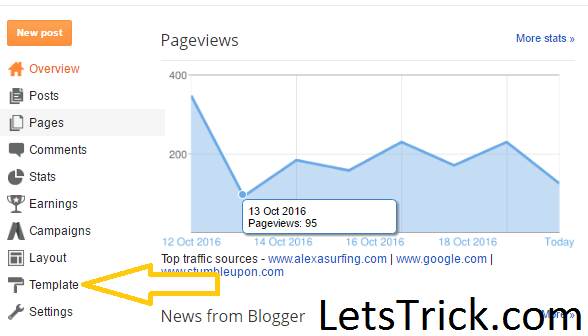 How To Increase Alexa Rank Of Your Blog [Unbelievable]. Promote Blog Post For Free :Secret Revealed [InfoGraphic]. Step 7:- Now go to Template. Step 8:- Now click on “Edit HTML”. Step 9:- Now just “left click” with your mouse in the HTML code box and then press “Ctrl+F”. A search box will open in code box then you have to search this code- <data:post.body/> (If you find this code more than once then I suggest you to try all of them one by one) . 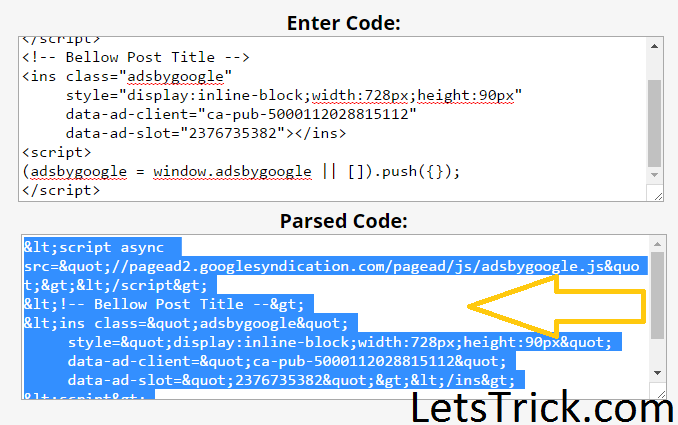 Step 11:- Replace “Place your ad code here” with the parsed adsense code which you have saved on notepad (Step 5th). (See in the above image). Dofollow Commentluv Enabled blogs 2016. Step 12:- Now just click on “Save template”. 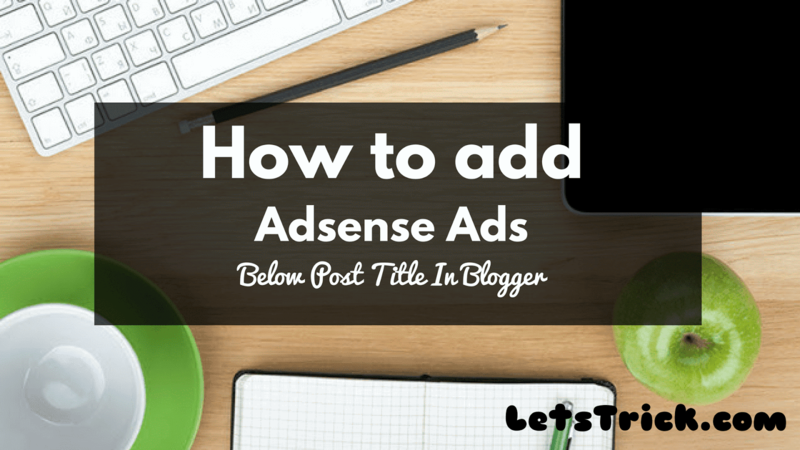 If you are still having any problem regarding how to put adsense ads on blogger then please feel free to comment below, I’ll be honored to help you out. I love being able to put Adsense code in uniquely unexpected places as I believe that it causes them to increase in clickability. Putting the code right below the post title is an awesome idea which I appreciate you sharing. What has been the revenue result for you when doing this?